O/o District & Sessions Judge, Dibrugarh. Applications in standard form are invited from citizens of India as defined under Article 5 and 6 of the Constitution of India, for filling up the following posts under the establishment of District & Sessions Judge, Dibrugarh. Educational Qualification: The candidates must have minimum education qualification of VIII standard. Age: Age not less than 18 years and not more than 43 years of age as on 01-01-2018. Relaxation of age will be admissible as per existing rules of the Government of Assam. Selection Process: Selection shall be made on the basis of personal interview. How to apply: Applications must be accompanied with self attested copies of all relevant documents/ testimonials in support of the education and other qualifications including experience. Three copies of duly signed recent passport size photographs should invariably be enclosed with the application. Last date of receipt of application is 02-03-2018. Application will be accepted during office hours. 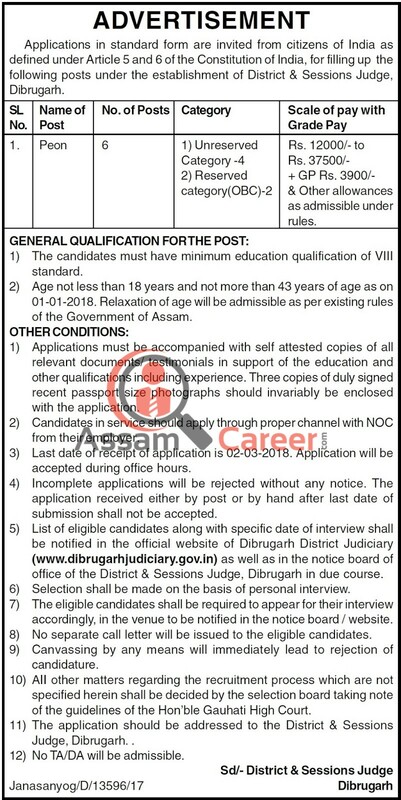 List of eligible candidates along with specific date of interview shall be notified in the official website of Dibrugarh District Judiciary (www.dibrugarhjudiciary.gov.in) as well as in the notice board of office of the District & Sessions Judge, Dibrugarh in due course. The application should be addressed to the District & Sessions Judge, Dibrugarh. .